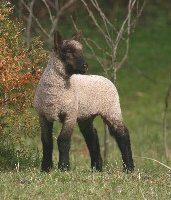 In North America, we tend to associate dark faced sheep with terminal sire breeds, but the Clun Forest, despite its dark face, is a superb maternal breed. In part because of the lamb’s narrow head and in part because of the wide, meaty hindquarters of the ewe, lambs just tend to slide out at lambing time. Ordinarily, little assistance is required at lambing or afterwards. Lambs are vigorous, getting to their feet quickly and going after something to eat with remarkable speed, if not agility. Those traits may be traceable to the breed’s origin on the rugged hills of Shropshire where easy lambing and vigorous lambs were directly related to survival. 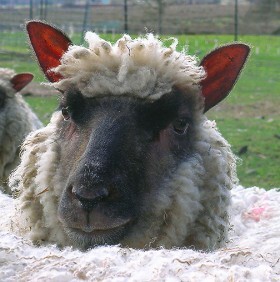 Cluns are alert and active, responsive to their surroundings and shepherd–which helps to make them a manageable breed. Their size–ewes tend to run about 130-150 pounds—also makes them easier to handle than some of the more common meat breeds in the U.S. and Canada. Clun carcasses are meaty, lean, and consistent. Many breeders find those carcasses an excellent fit for their direct lamb trade. One more point: Clun rams tend to be gentlemen around their shepherds. Many people are surprised by how easy they are to handle. Nonetheless, they are aggressive breeders and go to work at a young age. Finally, those rams pass along all the virtues of the purebred Clun ewe to their crossbred daughters—much to the appreciation of the commercial shepherd.